The following testimony in this article is absolutely true. Not only did I personally witness this event-for the first time my wife was also a witness to this phenomenon. During the description of the encounter that follows, as a previous “UFO believer” myself, I was reminded of the story of Betty and Barney Hill. If you are not familiar with their story that occurred in 1961, you can do a search with their names or their book entitled, “Interrupted Journey.” My story is nowhere near as detailed as their story and my truthful conclusions are the complete opposite to theirs. Furthermore, before the question even comes to your mind: There was no missing time! It was a cold February night in 2009 when my wife and I began a 4 hour journey to visit her family. I had just finished work for the day and my pregnant wife had all of our luggage packed for me to put into the car when I arrived home. With a full tank of gas in our car, we were finally ready to start our weekend. Driving down the highway, there was only about half-an-hour of sunlight left. With the radio turned on, we were having a comfortable drive looking at the sunset ahead of us. There wasn’t too much traffic on the road so I was enjoying the drive. We talked about our day and caught-up on anything new. I was feeling fairly well that night. For months prior, I had experienced tremendous demonic attacks since all of this began the previous summer. Spiritual warfare is very real. Anyone who has gone through these severe attacks will know that they battle you in your mind. Since becoming a true believer in Jesus Christ, I have found that the demonic attacks had diminished over time. That’s not to say that they’ve completely gone, but they tend to come in waves and to a lesser degree. I put in a disc to play some Christian music. As it started to become almost completely dark, I started to notice a very bright star in the sky. At first, I didn’t pay too much attention to it. We were only about half-an-hour into our drive and it’s quite natural for the stars to appear at night. Over the previous number of months I had been occupied so much with trying to develop ways for getting the truth about concerning so-called “aliens”-I really needed a break. Quite frankly, I didn’t want anything else supernatural to happen. I know that God had called me to get the truth out concerning the satanic lie of “aliens”, but I also didn’t want to focus too much on them. I have been very careful with what I had stated concerning my experiences-and I was keenly aware of the dangers of giving too much focus to these evil beings which are demons. 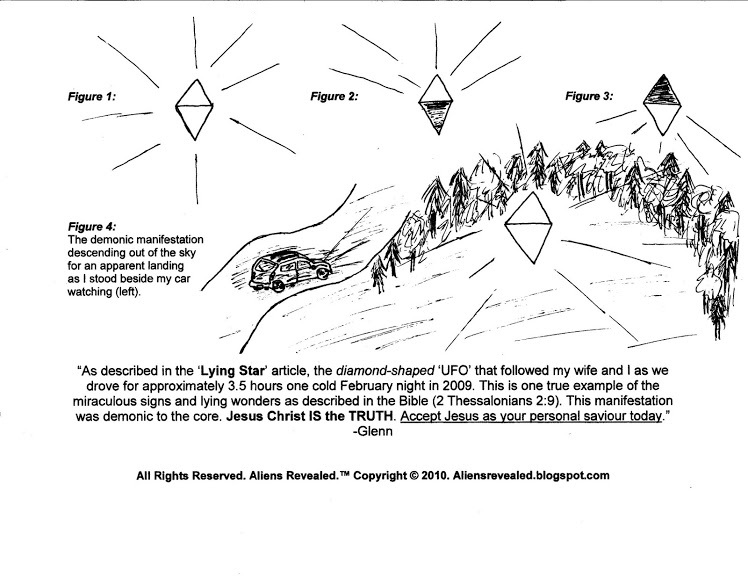 I knew that the power was in my testimony, but I had always hoped that not only will it clear up the Satanic lie of “aliens”-but also turn people’s focus to the TRUTH of JESUS CHRIST. After all, those who know their authority IN Christ-also know that Satan and his demons were completely defeated at the cross where Jesus paid for our sins with His own precious blood (for anyone who believes and receives Him as their Savior). All glory and honor to Jesus! Amen to that! As we started to put some road behind us, the star would always be in the front of our vehicle. It didn’t matter how many twists and turns in the road-the star was always there. Now, I had been through a lot over the past number of months and I had pretty much told my wife everything that I had seen and experienced. My wife had never seen anything in the videos that I had filmed (some people cannot), but she had always believed me nonetheless. With that being said, I didn’t want to push my luck. On this night, I just wanted a “normal” life for a change. As time continued to pass, I think it was my wife that finally commented to me and said something like, “That’s a bright star.” It’s almost comical, because for the last number of minutes I’ve thought to myself that most likely this isn’t a “star” at all-but I didn’t want to say anything! About half the trip is a lot of wilderness. In fact, there are many miles between gas stations for some of the journey. Just trees…and more trees. That’s why it was always important to make sure the tank was full before we left. The “star” continued to follow us until we were almost to our destination. We were not alone on this road; there were other cars that surely must have seen this “star” as well. This is the part that Christians reading this need to be made aware: My wife is a true believer and a Christian the majority of her life, and she was deceived by this “star.” She started thinking that it was a “heavenly event” happening before our very eyes. I had to tell her that there was NOTHING heavenly about what was going on and not to be deceived. There we were, two genuine Christians driving in our car with this demonic manifestation above us in the night sky. We were not involved in anything to provoke or summon such an occurrence that night. We were listening to Christian music the entire time while this was happening. Yet, the demonic were STILL trying to deceive. The “star” did give the appearance of something “good”. Appearances can be deceiving. The devil does masquerade as an angel of light. As we entered into the populated subdivision where my wife’s relatives live, the “star” began to descend. There it was-coming down. It looked like a perfect DIAMOND. A short distance away, we could now see that the “diamond” was perfectly divided in two. Let me try to explain what we saw: the top half would dim, and then the bottom half would shine. Then the entire “diamond” would shine. Then only the bottom half would shine..Etc. Do know how the car light in some cars slowly dim after you close the door? That is exactly how it was. It didn’t instantly go dim-the light would slowly dim. In this particular subdivision, there was a “U-shaped” area of land that looked like a future construction area with trees. It was basically just dirt and a tree line in the shape of a “U”. I’m trying to give you a visualization of what we had both seen. Can you picture in your mind a bright diamond-shaped-object coming down over this deserted area against a cold February night sky? As the car drove up a steep hill that overlooked this deserted area-I stopped. I then proceeded to get out of the automobile and watch this object in what appeared to be an apparent landing. This is the part that will make some of you laugh. I love my wife very much, but she was nowhere near as interested in what was taking place before our very eyes. She wanted to get going to see her family! There we were watching what so few have ever seen and she wants to get to her relatives home because it was getting late. Reluctantly, I got back into the vehicle and began driving again. I never saw any landing or what happened next. The last thing I saw was this “diamond” coming down. In hindsight I would have stayed longer to see what would happen, but with that being said, they are demons and it was only a “false sign and lying wonder”. We continued to drive for another couple of minutes to our destination and unloaded the car. As we met with her relatives, I couldn’t stop thinking about what we had just seen. You need to realize that up until this point I caught most of these things on film (with the exception of seeing them on the computer screen). This was something different. It happened without the camcorder. Furthermore, this was the very first time that my wife had seen with her own eyes what I was going through. In a way I was glad that this happened because now she would know for sure that I wasn’t going crazy! As I’ve stated numerous times before, the Lord gave me this message prior to this encounter: “The alien/UFO phenomenon will be used to explain the Rapture to non-believers.” I continue to share this message that I was given with others. This message will never change because it was a message given to me by God and He is always TRUTHFUL. Q. Do the four ‘stars’ serve other functions besides heralding Maitreya’s emergence? The quote above is 100% lies. It is false doctrines of demons. I wanted to show you this so you will not be deceived by what is going to happen-whether the Antichrist turns out to be Maitreya or not. For the record, I have no idea concerning the identity of the Antichrist. Regardless of the Antichrist’s identity, the “alien” explanation will definitely be used to explain what happened to the millions of missing true Christians around the world when we suddenly vanish. Satan has this false explanation already planned well in advance for when the actual Rapture does occur. Did you also notice in the above quote from the website that they attack the deity of Jesus-meaning of course, they are denying that Jesus IS God (Holy Trinity)? This is very common among abductees who testify that the “aliens” came from other planets and seemed so preoccupied about denying the deity of Jesus. Again, of course these beings are demons-there is no such thing as “aliens” from another planet. If this topic wasn’t so serious with literally billions of souls at stake, it would almost be humorous concerning the lies that the demons were trying to get away with on this topic. Back to the example of their lies, they attempt to change the story of the birth of Christ. Instead of it being a “star” that led the three wise men, now it’s a SPACESHIP! Again folks, all my thanks to Jesus, all of you who are reading this now are being shown how this lie is going to all piece together to prevent people from turning to Jesus and therefore ending up in hell. This satanic “alien” lie is going to be GLOBAL – HUGE! I give all Glory, Honor, &amp; Praise to the Lord for showing me His TRUTH. I would know absolutely NONE of this if the Lord had not opened my spiritual eyes to let me see. All of the credit goes to Him- and rightfully so because He is Good and Worthy of all our worship (that’s an understatement). It’s important to also mention that it is possible for a true Christian to be deceived by these evil beings. In this particular incident, they used a “white light” to give the impression of “Purity.” These demons are the complete opposite of any purity. They are vile, lying, deceiving, and apparently persistent…beings. “But I am not surprised! Even Satan disguises himself as an angel of light”. If you have accepted Jesus Christ as your personal Savior and Trust only in Him for your salvation- you have nothing to fear because He is God (Holy Trinity) and He will protect you. All of my praise goes to the Good Shepherd. Jesus Christ defeated Satan at the cross. By the shedding of His precious blood, Jesus has secured salvation to ONLY those who believe and trust in Him. Anyone can be saved! It’s so sad that the majority of the world has rejected Jesus Christ and will spend eternity separated from God. God the Father really did send his only begotten Son from heaven to earth- to be born of a virgin – to be crucified and pay the price for our sins. As I’ve heard mentioned somewhere before: Jesus paid a debt He did not owe, because we owed a debt we could not pay. He has risen! Salvation is more than believing that Jesus exists. As stated in the Bible, even these demons know that Jesus exists and they tremble at His name! Finally, it’s more than believing Jesus simply exists. You must accept Him your personal Savior. Before I was saved, I knew “about” Jesus but I didn’t KNOW Jesus. Do you understand what I mean? I didn’t have any personal relationship with Him. How do you start to know Jesus? Read the Bible and Pray! If you don’t have a Bible, go purchase one. What Bible version? I always compare other translations to the King James Version Holy Bible (KJV). I also like the English Standard Version Study Bible (ESV) and the New Living Translation (NLT). If you have never read the Bible, start in the Gospel of John in the New Testament (the next gospel after LUKE).